I operated on my TiVo recently. My TiVo got a hard drive enhancement. When we got the TiVo a couple of years ago, it was the smallest, cheapest one they had. In fact, it and a year of TiVo service were the cost of a year of TiVo service. For all practical purposes, it was free. It held 40 hours of programming. But here's the thing: you know how when you buy a VHS tape (remember those?) it might say "6 hours?" Well, that's at standard quality. Most VCRs have (or had) 3 speed settings. The slow setting allowed you to get 6 hours out of a tape. The medium speed setting let you get 4 hours. And the fast setting let you get 2 hours. And, the faster the speed setting, the better the quality; likewise, the slower the setting, the lower the quality. Same thing with TiVo. 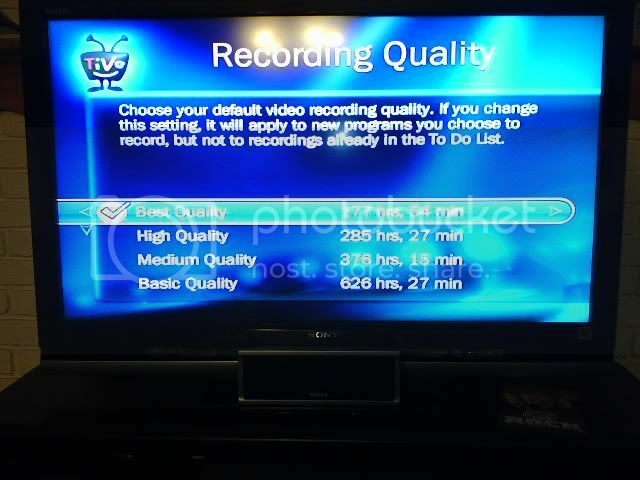 The 40-hour capacity on our TiVo is for basic quality. TiVo has 4 quality settings. And at the best quality, the capacity is only about 10 hours. You'd think that's plenty, but it wasn't. For instance, The Wife likes her soap operas, or, as we say here Down South, her "stories." We also record some other programs. And we like to set several up to keep until we delete them. Otherwise, when the TiVo gets full, it'll delete the older programs. And, if that happens, we might miss something. We don't get to watch everything right off, you see. Busy and all. So, while on the one hand, TiVo can record more than we can watch, on the other hand, it records it all at basic (low) quality. And, even then, we still do, on occasion, watch everything it's recorded. So, a newer, bigger TiVo might be in order, huh? Well, yeah. Or, just maybe, an upgrade to the current one. So, a DVR upgrade might be in order. Which, of course, meant me going to DVRUpgrade.com. Bought a new hard drive. And it wasn't hard to follow the upgrade procedures. And, now we have a bigger, better ... same ... TiVo. We new have 177 hours of best quality. That translates to 626 hours of basic quality. And, with the new TV, we're recording everything at best quality. Which means that, on Sunday afternoons, I get to sit with The Wife, watching As The World Turns or Guiding Light. All day long. You know, at first, this whole upgrade seemed like a good idea.